This product has been replaced by the Utility Throttle with 4 Digit Addressing and Infrared Capability (UT4) and is no longer available. Click here to view the UT4. These simple, cost effective throttles feature one large knob for speed control and a direction switch for direction control. Great add on throttle for all Digitrax Starter Sets, especially Zephyrs! As of 03/28/2011 is is no longer repairable due to unavailability of repair parts. Locomotives are selected with dial switches so that you can immediately see which loco is assigned to the throttle. Unique locomotive selection allows you to pick up running locomotives at their current speed. Utility Throttles can control 4 functions. These throttles are perfect for casual users and for those who prefer a more "traditional" throttle. The Utility Throttles are LocoNet Throttles, designed to operate on existing Digitrax LocoNet systems. These throttles can acquire & run one locomotive or consist (even the ones with four digit addresses). The user can control speed, direction, & functions for these units. By pressing Run/Stop, the user can stop the unit he is running but will not stop the whole layout. 128 speed step operation! You can select 14, 28, or 128 speed step operation for each individual Digitrax or other compatible DCC decoder when you program it so you don't have to sacrifice performance if you have some decoders that have 128 speed steps & some that don't. LED indicators, selection knobs and large speed control knob show throttle status at a glance & make operation easy. Control F0, F1, F2 & F3 from the keypad. These functions can be used for lighting, sound, etc. Utility Throttles are set up for easy access to 2 digit addresses 00-98. Address 99 is set up so that you can use it to select locomotives with 4 digit addresses. This gives you access to all 2-digit and 4 digit DCC decoder addresses. Utility throttles operate without a battery. Because of this, Utility Throttles will not work on LocoNet systems using stereo jacks as plug ins. 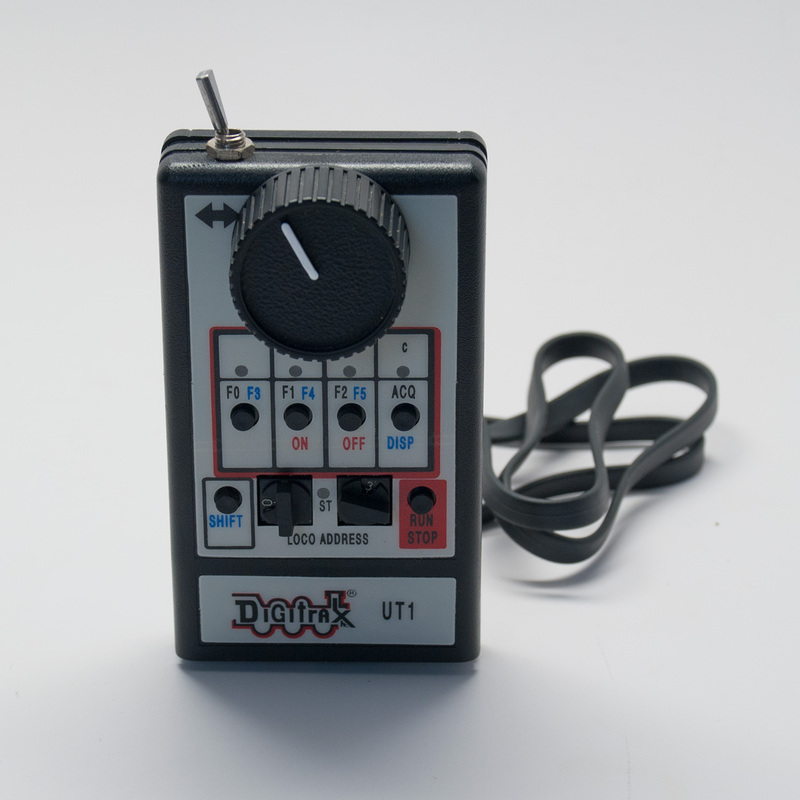 The UT1 has no programming capability.